1. William FENTON-1 was born in 1804 in Kentucky. He lived in Bond, Illinois, United States in 1840. He lived in Bond, Illinois in 1850. He lived in Bond, Illinois, United States in 1860. S H LORD was born in Illinois. i. unkonwn FENTON was born in 1828.
ii. Robert FENTON was born in 1833 in Illinois. He lived in Bond, Illinois in 1850. He lived in Bond, Illinois, United States in 1860. He married Lucinda Fenton about 1860.
iii. William D FENTON was born in 1837 in Illinois. 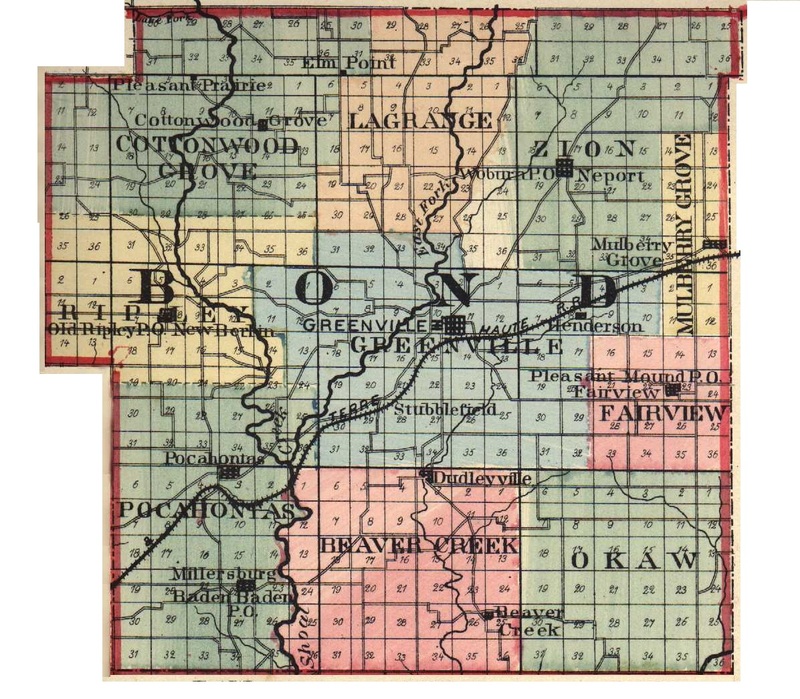 He lived in Bond, Illinois in 1850.
iv. Harriet Emily FENTON was born on 07 Dec 1838 in Illinois. She lived in Bond, Illinois in 1850. She died on 02 Aug 1916 in Sorento, Bond, Illinois. v. Joseph FENTON was born in 1841 in Illinois. He lived in Bond, Illinois in 1850.
vi. Rebecca FENTON was born in 1844. Nancy Brown was born in 1820 in Ohio. She lived in Bond, Illinois, United States in 1860. She lived in Mulberry Grove, Bond, Illinois, United States in 1880. She died in 1896. She was buried in 1896 in Bond, Illinois, USA (Mulberry Cemetery). 2. i. James Monroe FENTON was born on 10 Jul 1855 in Bond, Illinois, USA. He married Sarah Etta DOWNEN in 1899. He died in 1913 in Illinois. 3. ii. Marvin Nehemiah Bracestreet FENTON was born on 16 Jan 1857 in Bond, Illinois, USA. He died on 09 Dec 1943 in Farmersville, Illinois. 4. iii. Stephen Arnold Douglas FENTON was born on 08 Nov 1858 in Bond, Illinois, USA. He married Mary Ellen DALTON in 1883. He died on 08 Sep 1941 in Arrington, Wayne, Illinois. 2. James Monroe FENTON-2 (William-1) was born on 10 Jul 1855 in Bond, Illinois, USA. He lived in Arrington, Wayne, Illinois in 1900. He lived in Arrington, Wayne, Illinois in 1910. He died in 1913 in Illinois. He was buried in 1913 in Berry, Wayne, Illinois (Pin Oak Cemetery). Sarah Etta DOWNEN daughter of Virgil S DOWNEN and Agnes Jane WHITSON was born in Aug 1865 in Illinois. She lived in Arrington, Wayne, Illinois, United States in 1880. She lived in Arrington, Wayne, Illinois in 1900. She lived in Arrington, Wayne, Illinois in 1910. She lived in Barnhill, Wayne, Illinois in 1920. She lived in Denver, Colorado, USA in 1925 (1340 Santa Fe Dr). She died in 1946. She was buried in 1946 in Berry, Wayne, Illinois (Pin Oak Cemetery). 5. i. Arthur Alvin FENTON was born on 16 Mar 1887 in Illinois. ii. Arden W FENTON was born in Aug 1891 in Illinois. He lived in Arrington, Wayne, Illinois in 1900. He lived in Arrington, Wayne, Illinois in 1910. He lived in Denver, Denver, Colorado in 1930. 6. iii. Homer Steward FENTON was born on 25 Aug 1895 in Illinois. iv. Mandy Edith FENTON was born in Sep 1899 in Illinois. She lived in Arrington, Wayne, Illinois in 1900. She lived in Arrington, Wayne, Illinois in 1910. She lived in Barnhill, Wayne, Illinois in 1920. 3. Marvin Nehemiah Bracestreet FENTON-2 (William-1) was born on 16 Jan 1857 in Bond, Illinois, USA. He lived in Bond, Illinois, United States in 1860. He lived in Arrington, Wayne, Illinois, United States in 1870. He lived in Arrington, Wayne, Illinois, United States in 1880. He lived in Arrington, Wayne, Illinois in 1900. He lived in South Litchfield, Montgomery, Illinois in 1910. He lived in Bois D'Arc, Montgomery, Illinois in 1920. He lived in Farmersville, Montgomery, Illinois in 1930. He died on 09 Dec 1943 in Farmersville, Illinois. i. Nettie B FENTON was born on 17 Apr 1886 in Illinois. She lived in Arrington, Wayne, Illinois in 1900. She was buried in 1908 in Centralia, Clinton County, Illinois, USA (Gilmore Cemetery). She died on 18 Mar 1908. 8. ii. Oscar Logan FENTON was born on 07 Jan 1888 in Wayne Co, Illinois. He died on 31 Aug 1944 in Jefferson, Illinois. He married Nora Bell Fenton. 9. iii. Lillie Ethel FENTON was born on 14 Nov 1889 in Wayne, Illinois. She died on 05 Nov 1946 in Springfield, Sangamon, Illinois. She married Charles M O'CONNOR. iv. Oly Jane FENTON was born in Jan 1891 in Illinois. She lived in Arrington, Wayne, Illinois in 1900.
v. Emma S FENTON was born in Jan 1898 in Illinois. She lived in Arrington, Wayne, Illinois in 1900.
vi. Fredrick M FENTON was born on 28 Jul 1895 in Johnsonville, Wayne, Illinois, USA. He lived in Arrington, Wayne, Illinois in 1900. He lived in South Litchfield, Montgomery, Illinois in 1910. He lived in Bois D'Arc, Montgomery, Illinois in 1920. He lived in Montgomery, Illinois. He lived in Farmersville, Illinois. vii. Elizabeth A FENTON was born in Jan 1897 in Illinois. She lived in Arrington, Wayne, Illinois in 1900. She lived in South Litchfield, Montgomery, Illinois in 1910. 9. viii. Hobart R FENTON was born on 30 Sep 1900 in Illinois. He died in Jul 1977 in Girard, Macoupin, Illinois. ix. Esther Fenton was born in 1907 in Illinois. She lived in South Litchfield, Montgomery, Illinois in 1910. She lived in Bois D'Arc, Montgomery, Illinois in 1920. 4. Stephen Arnold Douglas FENTON-2 (William-1) was born on 08 Nov 1858 in Bond, Illinois, USA. He lived in Bond, Illinois, United States in 1860. He lived in Arrington, Wayne, Illinois, United States in 1880. He lived in Fairfield, Wayne, Illinois in 1900. He lived in Walker, White, Arkansas in 1910. He lived in Red River, White, Arkansas in 1920. He lived in Arrington, Wayne, Illinois in 1930. He died on 08 Sep 1941 in Arrington, Wayne, Illinois. He lived in Arrington, Wayne, Illinois. Mary Ellen DALTON daughter of Mecajah M DALTON and Eliza J MATTHEWS was born on 12 Dec 1856 in Ohio, Kentucky. She lived in Fairfield, Wayne, Illinois in 1900. She lived in Walker, White, Arkansas in 1910. She lived in Red River, White, Arkansas in 1920. She died on 16 Mar 1930 in Arrington, Wayne, Illinois. i. Ena FENTON was born in Aug 1883 in Illinois. She lived in Fairfield, Wayne, Illinois in 1900.
ii. William FENTON was born in Apr 1887 in Illinois. He lived in Fairfield, Wayne, Illinois in 1900. He lived in Walker, White, Arkansas in 1910.
iii. Edward FENTON was born in Mar 1892 in Illinois. He lived in Fairfield, Wayne, Illinois in 1900. He lived in Walker, White, Arkansas in 1910. 10. iv. Iva FENTON was born in Aug 1894 in Illinois. She married Jesse A MILLER. v. Inez FENTON was born in Sep 1897 in Illinois. She lived in Fairfield, Wayne, Illinois in 1900. She lived in Walker, White, Arkansas in 1910. 5. Arthur Alvin FENTON-3 (James Monroe-2, William-1) was born on 16 Mar 1887 in Illinois. He lived in Arrington, Wayne, Illinois in 1900. He lived in Arrington, Wayne, Illinois in 1910. He lived in Denver, Denver, Colorado in 1930. He lived in Rio Blanco, CO.
i. Glenn E FENTON was born in 1910 in Illinois. He lived in Arrington, Wayne, Illinois in 1910. He lived in Denver, Denver, Colorado in 1930. Elva H Fenton was born in 1896 in Missouri. She lived in Denver, Denver, Colorado in 1930.
i. Wayne S Fenton was born in 1926 in Colorado. He lived in Denver, Denver, Colorado in 1930. 6. Homer Steward FENTON-3 (James Monroe-2, William-1) was born on 25 Aug 1895 in Illinois. He lived in Arrington, Wayne, Illinois in 1900. He lived in Arrington, Wayne, Illinois in 1910. He lived in Barnhill, Wayne, Illinois in 1920. He lived in Denver, Colorado, USA in 1930 (1340 Santa Fe Dr). He lived in Denver, Denver, Colorado in 1930. Ruth E Fenton was born in 1901 in Illinois. She lived in Barnhill, Wayne, Illinois in 1920. She lived in Denver, Colorado, USA in 1928. She lived in Denver, Denver, Colorado in 1930.
i. Rosemary E FENTON was born in 1921 in Colorado. She lived in Denver, Denver, Colorado in 1930.
ii. James F FENTON was born in 1923 in Colorado. He lived in Denver, Denver, Colorado in 1930.
iii. Robert R FENTON was born in 1925 in Colorado. He lived in Denver, Denver, Colorado in 1930.
iv. William H FENTON was born in 1927 in Colorado. He lived in Denver, Denver, Colorado in 1930.
v. Elmer F FENTON was born in 1930 in Colorado. He lived in Denver, Denver, Colorado in 1930. 7. Oscar Logan FENTON-3 (Marvin Nehemiah Bracestreet-2, William-1) was born on 07 Jan 1888 in Wayne Co, Illinois. He lived in Arrington, Wayne, Illinois in 1900. He lived in Sausalito, Marin, California in 1910. He lived in Bois D'Arc, Montgomery, Illinois in 1920. He lived in Berry, Wayne, Illinois in 1930. He died on 31 Aug 1944 in Jefferson, Illinois. He lived in Montgomery, Illinois. He lived in Sims, Illinois. He lived in Sims, Berry Wayne, Ills.. He was buried in Wayne City, Wayne, Illinois, USA (Hopewell Cemetery). Nora Bell Fenton was born in 1893 in Illinois. She lived in Bois D'Arc, Montgomery, Illinois in 1920. She lived in Berry, Wayne, Illinois in 1930.
i. Creola FENTON was born in 1916 in Illinois. She lived in Bois D'Arc, Montgomery, Illinois in 1920. She lived in Berry, Wayne, Illinois in 1930.
ii. Thelma FENTON was born in 1918 in Illinois. She lived in Bois D'Arc, Montgomery, Illinois in 1920. She lived in Berry, Wayne, Illinois in 1930.
iii. Elberta FENTON was born in 1919 in Illinois. She lived in Bois D'Arc, Montgomery, Illinois in 1920. She lived in Berry, Wayne, Illinois in 1930.
iv. Oscar FENTON was born in 1923 in Illinois. He lived in Berry, Wayne, Illinois in 1930.
v. Henry M FENTON was born in 1925 in Illinois. He lived in Berry, Wayne, Illinois in 1930.
vi. James E FENTON was born in 1926 in Illinois. He lived in Berry, Wayne, Illinois in 1930. 8. Lillie Ethel FENTON-3 (Marvin Nehemiah Bracestreet-2, William-1) was born on 14 Nov 1889 in Wayne, Illinois. She lived in Arrington, Wayne, Illinois in 1900. She lived in South Litchfield, Montgomery, Illinois in 1910. She lived in Farmersville, Montgomery, Illinois in 1930. She died on 05 Nov 1946 in Springfield, Sangamon, Illinois. She lived in Farmersville, Montgomery, Illinois. Charles M O'CONNOR was born in 1879 in Illinois. He lived in Farmersville, Montgomery, Illinois in 1930.
i. Arthur FENTON was born in 1905 in Illinois. He lived in South Litchfield, Montgomery, Illinois in 1910. He lived in Bois D'Arc, Montgomery, Illinois in 1920. He lived in Springfield, Sangamon, Illinois in 1930. He married Janet Fenton. 9. Hobart R FENTON-3 (Marvin Nehemiah Bracestreet-2, William-1) was born on 30 Sep 1900 in Illinois. He lived in South Litchfield, Montgomery, Illinois in 1910. He lived in Bois D'Arc, Montgomery, Illinois in 1920. He lived in Farmersville, Montgomery, Illinois in 1930. He was buried in 1977 in Farmersville, Montgomery, Illinois (Rovey Cemetery). He died in Jul 1977 in Girard, Macoupin, Illinois. Emma BAPTIST was born in 1906. She died in 1928.
i. Robert C FENTON was born in 1922 in Illinois. He lived in Farmersville, Montgomery, Illinois in 1930.
ii. Elizabeth G FENTON was born in 1925 in Illinois. She lived in Farmersville, Montgomery, Illinois in 1930. 10. Iva FENTON-3 (Stephen Arnold Douglas-2, William-1) was born in Aug 1894 in Illinois. She lived in Fairfield, Wayne, Illinois in 1900. She lived in Walker, White, Arkansas in 1910. She lived in Bullard, Prairie, Arkansas in 1920. She lived in Arrington, Wayne, Illinois in 1930. She lived in Arrington, Wayne, Illinois in 1930. Jesse A MILLER was born in 1890 in Illinois. He lived in Bullard, Prairie, Arkansas in 1920. He lived in Arrington, Wayne, Illinois in 1930.
i. Stanley MILLER was born in 1912 in Illinois. He lived in Bullard, Prairie, Arkansas in 1920.
ii. Jewell O MILLER was born in 1914 in Illinois. She lived in Bullard, Prairie, Arkansas in 1920. She lived in Arrington, Wayne, Illinois in 1930.
iii. Bernard C MILLER was born in 1916 in Illinois. He lived in Bullard, Prairie, Arkansas in 1920. He lived in Arrington, Wayne, Illinois in 1930.
iv. Agnes M MILLER was born in 1918 in Illinois. She lived in Bullard, Prairie, Arkansas in 1920. She lived in Arrington, Wayne, Illinois in 1930.
v. Fern G MILLER was born in 1924 in Illinois. She lived in Arrington, Wayne, Illinois in 1930.
vi. Arthur E MILLER was born in 1928 in Arkansas. He lived in Arrington, Wayne, Illinois in 1930.